Events in Stateless take place during the politically charged climate of the late 1980’s. At that time the USSR was home to the largest population of Jews in Europe. Under pressure from various political sources, including that of U.S. Jewry, the Soviet government opened the borders and allowed its Jewish population to leave the country. This time the migrants would have the freedom to choose their destination, but those who hoped to make the United States their home now had to prove “a reasonable fear of persecution.” For those born into a climate where discrimination was the norm, this was difficult and without any information or a political voice, they were denied refugee status in ever increasing numbers. This left thousands stranded in Italy -- Stateless. The narrative in the film is unfolded through first hand accounts by emigres themselves. It starts by explaining the agonizing weight of the decision to leave, highlighted by stories of discrimination both subtle and overt, and the possible social repercussions of this choice. Even in the time of “Perestroika,” such a leap of faith meant a forfeit of citizenship and all personal property, and in the case of refusal, still carried with it social and career suicide. Despite this, in a matter of months, thousands pursued this course at the price of bullying, extortion and bribery. Finally, with their belongings condensed into a few suitcases and with a meager allowance of several hundred dollars per family, emigres said their last goodbye to friends and family and left the only home they’ve ever known. Vienna, was the first stopping point on the immigration journey, as part of the infamous Vienna-Rome pipeline used in previous migrations. Stateless provides the viewer with a unique glimpse of it through the eyes of those seeing the Western world for the first time. A deeply emotional resonance from people who have only experienced the West through the filter of communist propaganda. For many this is a bittersweet validation of their decision to leave. US bound families moved on to Italy, the next stop in the journey and the place where they petitioned the U.S. embassy for acceptance into the country. 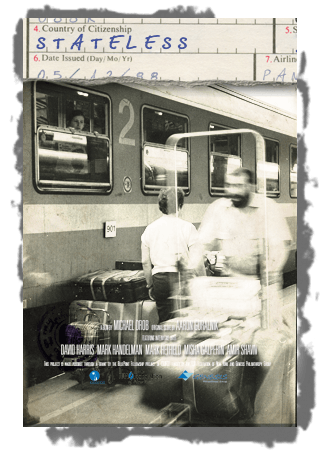 The film includes archival footage of this harried arrival in the chaos of suitcases and people. Here, close to 40% of families seeking asylum had their applications denied seemingly without reason. For them, it was an everyday struggle to make ends meet and shouldering the hopelessness that came from not knowing what will happen next. The director also included an important perspective of those on the other side of this experience, the agency workers, volunteers, and Jewish political leaders. People like David Harris from the American Jewish Committee and Mark Hetfield from HIAS, who ushered immigrants into their new life despite cultural and language barriers. Standing witness as the emigres found their voice and began to regain a connection to the Jewish people; something that was almost completely severed by years of communist repression. Leadership from NYANA and JOINT provided the last critical part of the triad, the political commentary, explaining the gears and cogs that kept this process moving forward. As all the stories are tied together a multifaceted picture emerges. In the end, 25 years later, there is an answer for those wondering “Why was I denied?” through a story told in the voices of those who lived it.